Sophisticated halter European wedding gown in ivory with empire waist; shirred bodice with clear and silver bugle beads. 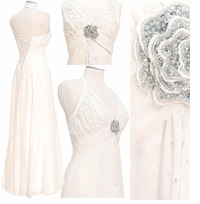 This bridal dress has softly gathered waistline accented with rosette silver seed beads and clear mixed sequins. Popular criss-cross back with tie-up for easy fit.